Veterans, active military personnel, Austin residents and local government leaders celebrated last week the ground breaking of the Veterans’ Peace Garden that will be dedicated to those who’ve served in the armed forces. Coordinated by the South Austin Neighborhood Association and funded by 29th Ward Ald. 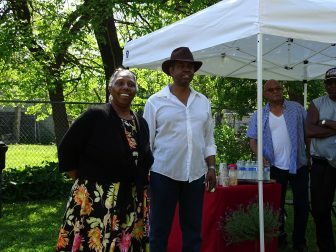 Chris Taliaferro’s participatory budgeting initiative, the garden at 5413 W. Madison St. will include a flag pole, a gazebo and landscape design created by Tects LLC principal architect Diana Furuya, Christy Webber Landscapes and Julie Samuels, a member of the Chicago Garden Association. SANA also worked with the NeighborSpace non-profit, which purchased the abandoned lot where the garden will be from a private owner. Taliaferro said the funds, which totaled $70,000, as reported by Austin Talks June 13, 2016, were originally meant to develop several gardens throughout Austin but were consolidated into building the veterans’ garden after plans for other sites never came to fruition. 29the Ward Ald. 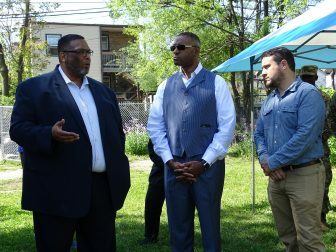 Chris Taliaferro, Cook County Commissioner Richard Boykin and Ben Halphand, executive director of NeighborSpace, speak about the community impact of the veterans’ garden at last week’s groundbreaking ceremony. Consolidated use of funds for the veterans’ garden was approved by the city in March. 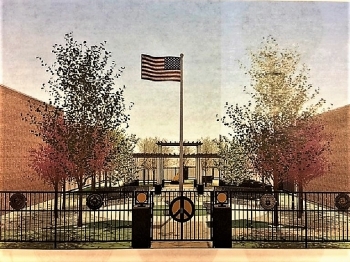 Taliaferro added that combining the funds allowed SANA to construct a quality garden that exhibits the community’s thankfulness to its veterans. “This is a great project for the ward, especially because it gives honor to those who have served in our armed forces,” Taliaferro said. Cook County Commissioner Richard Boykin, who helped clean the lot last year after it was purchased, said he was happy the city could assist in the construction of the garden. “This is a great example of what can happen when you have a community, elected officials and companies coming together for the benefit of veterans and for the benefit of communities,” Boykin said. Cherita Logan, district director for U.S. Rep. Danny K. Davis, who participated on behalf of the congressman, who was in Washington. South Austin Neighborhood Association President Cassandra Norman (left) and Vice President Lee Redmond (right) at the May 24 groundbreaking ceremony of the Veterans’ Peace Garden in Austin. SANA president Cassandra Norman said while the garden is dedicated to veterans and will provide a place for them to rest and gather, the garden will also become a valuable asset to the Austin community as a whole. She added that many people will become aware of the garden because of its location on the busy Madison Street. Veteran John Tibbs, who served in the Vietnam War from 1968 to 1971, said he was happy to see there was interest from the city and community in supporting the armed forces through the garden, something that is often lost after their service is ended. Tibbs said he is proud of his service regardless of the recognition he receives as a veteran, but that he appreciates the community honoring him and others with the garden. “Instead of just posting something on the internet or a flag being posted every now and then, this is an actual physical structure that says, ‘This is what you guys have done and this is what we want to do for you because of that,’” Tibbs said. Work on the garden will begin immediately, and although a completion date has not been announced, Norman said she hopes it will be finished by Veterans Day on Nov. 11. While the garden has the required funds to be built, SANA will be searching for sponsors and donors to contribute to additional features after the initial construction, including a butterfly garden and a bronze statue to honor service animals.